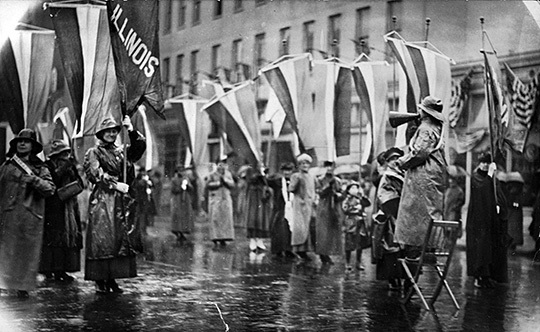 President Wilson’s treatment of the suffrage pickets indicates his profound understanding of the non-essentials of liberal government. The pardoning of the imprisoned women was (as the current phrase has it) the “gesture” of not only a humane but an enlightened ruler. No doubt it was in part motivated by the natural repugnance of a Southern gentleman to the idea of women of his own social class being cast into dungeons (however carefully swept and, as it were, garnished, beforehand). But, more important, it signified his recognition of the right of political malcontents to remind the executive of their wrongs—to parade, in the most literal sense, their grievances before him. 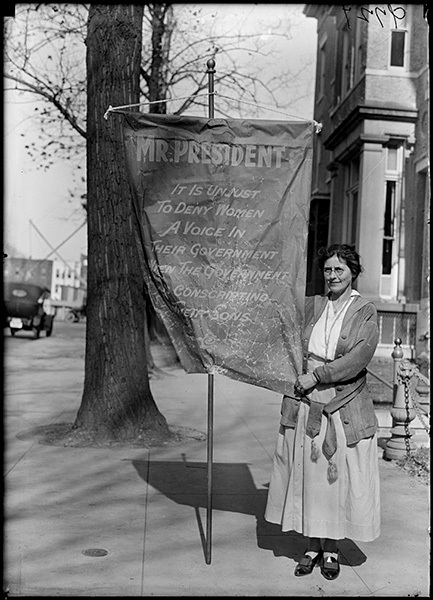 Mary Winsor with banner, Washington, D.C.
Harris & Ewing Photography, 1917. It was probably in such a light that the situation was presented to him by Dudley Field Malone, Collector of the Port of New York, an appointee of President Wilson; and we have Mr. Malone to thank, along with the militant suffragists, for securing thus dramatically a ratification at Mr. Wilson's hands of one of the principles which we inherit from the Magna Charta. (In view of our recent happy reunion with the Mother Country, we speak by preference of an English rather than a Colonial Document). Grand Picket at the White House the eve of President Woodrow Wilson's second inauguration. Harris & Ewing Photography, Washington, D.C., 1917. And, during a war in which, in order unselfishly to establish democracy in Germany, it appears to be necessary to forego its benefits in America, this salvage of a fragment of our liberties is a matter to be grateful for. 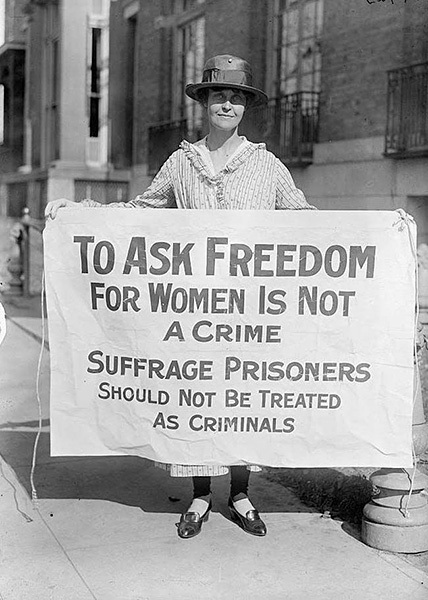 We understand that the President is being much sympathized with in official circles in Washington over the social embarrassments of the militant suffrage campaign. When a woman who is, incidentally, the wife of one your political supporters, and who has dined with you the evening before, and whom you are pleased to pardon out of jail, not only confronts you unrepentantly next day on your afternoon ride with her challenging banner, but writes you a letter asking indignantly what you mean by pardoning her without stating your reasons!